Carol is no stranger to radio, having done numerous interviews on district, state and national radio and of course her CDs are regularly played. She has been a celebrity guest on programs such as Hunter Lifestyle and numerous country type shows. In 2007 Carol had a regular segment on Newcastle ABC's Midweek Forum which required her to write poems - while on air - in response to topics discussed by panellists. This was hugely popular and those poems are in her award winning book 'Touching Tales' She also performed in a rado play for ABC Radio of the Air, Newcastle. 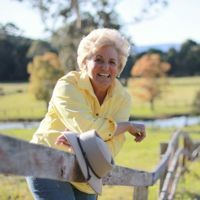 Carol's episode on the NSW town of Cowra received considerable accolades. She was invited back to speak and perform the poem at the Breakout Commemoration Dinner with the Japanese Military Attache present for the first time. The program went to air in January 2010 to immense response and has been aired several times since. 2012 Part of US Tour included a performance on "America's Soul, Live" (radio prog.) and a televised performance in Golden, Co. as part of the Colorado Cowboy Poetry Gathering.